Every child should have access to play. Be it disaster or disease, children are exposed to different situations where they become vulnerable, and they are forced to put their childhood on hold. They may already be suffering from trauma and distress, and there is often no space or opportunity for them to play. Unilab Foundation believes that play is essential to a child’s holistic development, which is why Play It Forward (PIF) was launched in 2012. All of PIF’s activities are designed to highlight play and its significance to the mental health of children, especially in vulnerable situations. 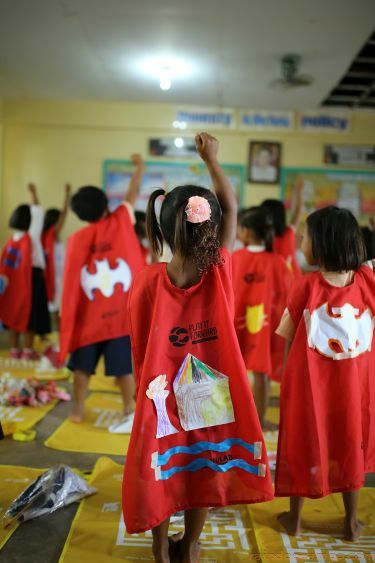 Play It Forward uses therapeutic play to provide psychosocial support to pediatric patients and to children in post-disaster or disaster-prone communities. This year, Play It Forward takes play further with Play Advocacy Week 2018, a week-long campaign to encourage everyone to take play seriously and to explore how play can be integrated in today’s society. Happening from November 18 to 24, Play Advocacy Week 2018 aims to make the public recognize the importance of play in a child’s holistic development. Play can allow children as well as adults to rise up from challenges and regain the strength to live a full life. Play It Forward has enabled access to play for thousands of children by facilitating play sessions in hospitals and communities, therefore providing them with safe spaces they need to release stress and build resilience. “Play It Forward hopes to reach more communities and organizations through Play Advocacy Week. We invite everyone to join our cause,” says Lilibeth Aristorenas, Executive Director of Unilab Foundation. Companies, organizations, families and individuals can all become Play Champions to help make play happen for Filipino children, for a healthier Philippines. Be part of the Play Advocacy Week 2018 celebration by organizing your own activity in your respective communities and groups, or spreading the word through social media. Play Advocacy Week 2018 is led by Unilab Foundation’s Play It Forward and endorsed by the Council for the Welfare of Children. This activity is supported by the Department of Education, UNICEF, World Vision, City of Tacloban, City of Valenzuela, City of Malabon, DepEd Ilagan, Isabela, Municipality of Atimonan, Quezon, DepEd Marinduque, DepEd Surigao City, DepEd Bicol, Gawad Kalinga, Fundlife International, Ateneo Bulatao Center for Psychology Services, Miriam College, MLAC Institute, The Mind Museum, PETA, Fe Del Mundo Medical Center, Nicanor Reyes Medical Foundation, Lung Center of the Philippines, Philippine Heart Center, Rizal Medical Center, National Kidney Transplant Institute, Capitol University Medical Center, Our Lady of Peace Hospital, Dr. Arturo Pingoy Medical Center, Lariosa Clinic and Hospital, Southern Philippines Medical Center, Tebow Cure Hospital, Metro Davao Medical & Research Center, Inc., National Children’s Hospital, HealthServ, Philippine Children’s Medical Center, My Brave Little Warrior, Metrobank Purple Hearts Club, Cherubs Therapeutic Massage Therapy Advocates, Inc., Kythe Foundation Inc., World Surgical Foundation, Unilab, Gurufirm, Philippine School of Interior Design, Philam Foundation and ComCo Southeast Asia. For partnerships and more information about the Play Advocacy Week, please contact the secretariat at (+632) 858-1000 local 8163 or email partnerships@unilabfoundation.org. You may also visit www.facebook.com/PlayItForwardPH and www.unilabfoundation.org.